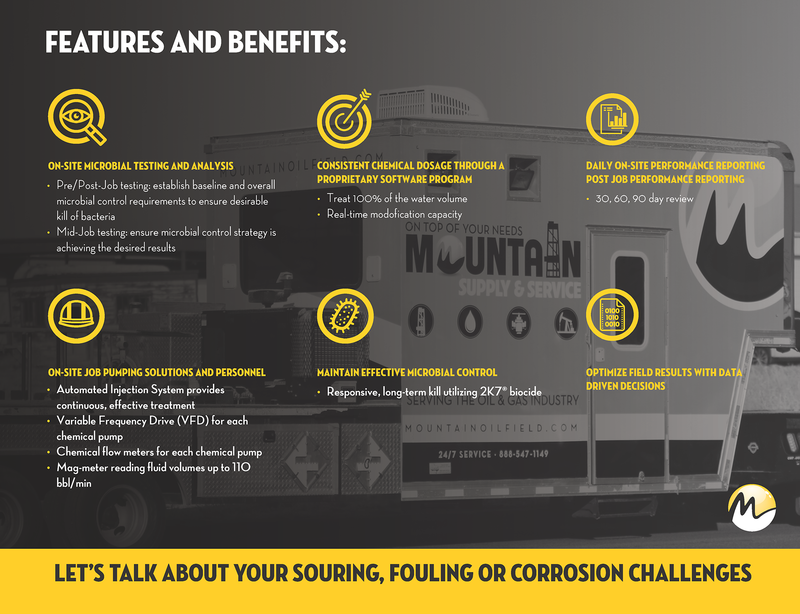 Mountain Supply & Service Water Treatment Solutions provides application-specific water treatment programs for each stage of oilfield operations. We deliver with a total service concept in developing specialty chemical and water treatment programs. Service is more than in our name, it’s the prime ingredient in our program offerings, and wired into our DNA as a company. We are a team of experts with effective total treatment programs and analytical tools to provide chemical and biological analysis of your water by skilled chemical and technical staff to ensure the we are Killing it in Completions! Do you have random wells going sour? Are black solids being seen in some new wells, not in others? Are there more corrosion issues in new well assets? Mountain Supply & Service has you covered! We have the tools to perform a comprehensive water analysis, identify the root of the problem, and provide a complete solution tailored to your specific application. Our team of analysts, engineers, and technicians have the experience to handle any situation and prevent these problems from reoccurring. We start by taking samples from your wells and studying their biological and chemical makeup. Next, we prescribe a unique combination of chemicals that target the problem, and put together a thorough case study to back our conclusions and present them to you along with the data we collect to optimize field results with data driven decisions. With your approval, we'll bring in our state-of-the-art injection units and perform treatment on your well(s). We then repeat the entire process until optimal results are obtained. Rest assured, you can count on us to provide all the services you need. As a Customer Senior Engineer stated, "A complete water analysis and our ability to perform these tests is what separates Mountain Supply & Service from everyone else." Here at MSS, we stress the importance of investigating the big picture when it comes to Water Treatment Solutions. While it may seem convenient to immediately jump to a quick kill application, this brute-force approach ignores other factors, such as corrosive water chemistry, that could be contributing to the problem. If you let the data drive your decisions instead, you won't waste any precious time or money on guesswork that may or may not restore your well to its full output potential. With our microbial testing and comprehensive water analysis process, we can pinpoint every contributor to the problem and give you the results you need to succeed in completions. Water Treatment Solutions – Keys to Killing it in Completions!